Many people securing their first business loan are often elated to make it to the point where they can fund their business and move forward. But often, that elation lasts up to the point when they inevitably must visit their accountant to discuss taxes. Once in the accountant’s office it becomes the tax equivalent of navigating a Pennsylvania corn maze but without the fun and pumpkin-spiced cider at the end. If you have a business loan one of the most common questions asked is, “Can I write off my business loan on my taxes”? Unfortunately, the short answer to that question is no, you cannot write off a business loan on your taxes because you aren’t allowed to claim it as income for the business. However, that in isn’t the end of the story when looking for legitimate ways to reduce your tax burden for your business. Because while you can’t write of the principal for the loan, you can write off the interest on the note. And you can purchase equipment, supplies and other goods for legitimate use in the business that can be written off. If you have borrowed money from a bank for a business loan then the interest on that loan is deductible. You can also deduct interest from a business loan lent to you by a relative. And the same is true if you have used a credit card for start-up purchases for the business as well. The IRS will allow you to deduct any of those types of interest. However, you should be cautious, especially when considering interest from credit cards and family loans. As the IRS will review these closely, it is very important to document the purchases made using these methods to get past any future audit should one result in a given year. And keep in mind, you can only deduct the interest from purchases made with the money from the loan. Interest is not deductible for funds unused from the loan that remain in the bank for use against future operating expenses. But that isn’t the end of the story. While you can’t write off the principal of the loan itself, beyond just writing off the interest you can write off purchases made for business assets, operating expenses, office supplies and a host of other things. The first step is to determine that the expenses paid with your loan were both ordinary and necessary. If it is a common expense accepted within an industry it is defined as “ordinary”. If it is required to operate your business it is defined as “necessary”. The IRS requires that both conditions be met before deductions are allowed. Office Supplies: Whether you use a home office deduction or not, office supplies for the business are deductible. As with all other purchases, records should be kept as proof the purchases were made for the business. Office Furniture and Office Equipment: Purchases made in this category may be depreciated entirely in a single year or spread out over several years. Software and Subscriptions: Subscriptions for professional journals and magazines that are used by the business are deductible. And any new software purchased for the use of operating the business is can be fully expensed for that year as well. Legal Fees for Start-up Expenses: If you paid legal fees to help get your business off the ground you can deduct the cost of those fees for the year they are incurred. Travel Expenses: Travel expenses for business travel are 100% deductible. This includes hotel as well as air and auto travel. Meals during travel are deductible as well but only at a 50% rate. o Use the Standard Mileage Deduction: For 2017 this is $0.53 per mile. o Use Actual Expenses: You can use oil, gas and other expenses if you keep meticulous records. Advertising: If you promote your business through advertising you can deduct these costs as well. This includes website set up and maintenance, business cards, promotional material and direct mail. Obtaining a business loan can be nerve wracking, and doing taxes for your business can be even more so. 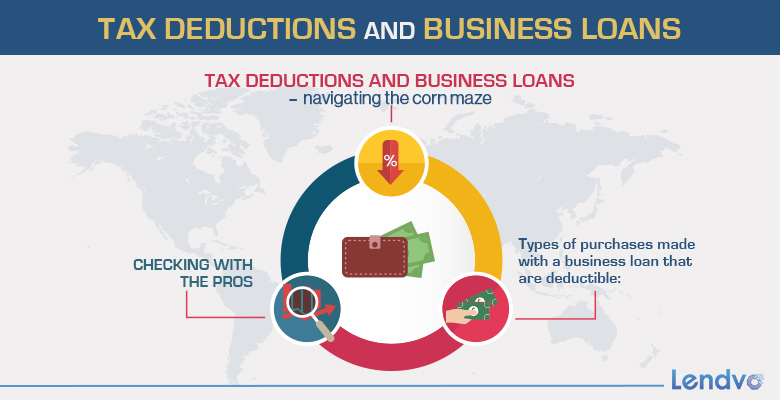 But as discussed there are ways to deduct some of the expense of the loan directly – through the deduction of interest on the loan – as well as indirectly, through purchases made using the loan for use within the business. Money left in the bank as proceeds from the loan will do you no good either directly or indirectly. By putting the loan funds to work you may not be able to write off the principle, but you can write off what was purchased when using that principle and find your way out of the corn maze in time for a little pumpkin-spiced cider after all.